Arlington High School, Arlington, Texas, Class of 1971. If Your Job is So Great? WHY do they have to pay you to do it??? Lay down & die or shake it off, step up & live. 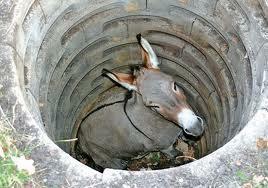 One day a farmer's donkey fell down into a well. The animal cried piteously for hours as the farmer tried to figure out what to do. Finally, he decided the animal was old, and the well needed to be covered up anyway; it just wasn't worth it to retrieve the donkey. He invited all his neighbors to come over and help him. They all grabbed a shovel and began to shovel dirt into the well. At first, the donkey realized what was happening and cried horribly. Then, to everyone's amazement he quieted down. A few shovel loads later, the farmer finally looked down the well. He was astonished at what he saw. With each shovel of dirt that hit his back, the donkey was doing something amazing. He would shake it off and take a step up. As the farmer's neighbors continued to shovel dirt on top of the animal, he would shake it off and take a step up. Pretty soon, everyone was amazed as the donkey stepped up over the edge of the well and happily trotted off! Life is going to shovel dirt on you, all kinds of dirt. The trick to getting out of the well is to shake it off and take a step up. Each of our troubles is a steppingstone. We can get out of the deepest wells just by not stopping, never giving up! Shake it off and take a step up. 1. Free your heart from hatred - Forgive. 2. Free your mind from worries - Most never happens. 3. Live simply and appreciate what you have. 5. Expect less from people but more from God. or pass this along to someone else to share the lesson . Life is NOT fair, but people can be reasonable. Insist on it. You play the cards you’re given and you play the best hand possible. Don't look back. Do it now - this isn't a Dress Rehearsal.